I wanted to re-create “Funfetti” boxed cake mix… It was always one of my favorite mixes in the cake section;) I figured out the coconut flour sprinkles right away… however… baking a coconut flour based cake proved to be much more difficult. I experienced every problem possible… too flat, too greasy, too dry and gritty, green bottoms (really!) and not to mention just flat-out gross! I really did not want to include nuts so it could be considered “school friendly”. The xanthan gum turned out to be the missing link. Some people may not be familiar with xanthan gum, however, it is an indigestible fiber, and does not need to be calculated into a ketogenic recipe. It is what makes the cake spongy and retain the rise from baking. It also helps hold all of the oil and keep the ingredients emulsified. It is not an ingredient I would choose to use on a daily basis, but sometimes you need to eat cake! I have never seen any adverse reaction to xanthan gum, but please run it by your dietitian just to be sure. You could also replace the xanthan gum with konjac root. It acts nearly identical to xanthan in baked goods and is a healthier option. India Tree makes a great 100% all natural vegetable based food coloring, but if you prefer to avoid food coloring or just want a plain white cake, just leave the sprinkles out and use all plain coconut flour. I frosted the cake with about 50g of Buttercream Frosting flavored with almond and lemon extract. I sincerely hope this recipe helps make a keto birthday special! Plan ahead to make these the day before baking! Combine 1 tablespoon of coconut flour with equal parts water. Stir to combine. Add 1 drop of food coloring (natural food coloring is preferred) to the coconut flour and water. Make sure the color is evenly distributed. Using an off set spatula, spread the colored coconut flour on a piece of parchment paper until it is very thin. Allow it to air-dry overnight. When it is thoroughly dried, break it into very small pieces and store in an airtight jar. Each color is made separately using the same process. *Please note: for the following recipe, only 2 grams of colored coconut flour sprinkles are used. If using the KetoDietCalculator, use “coconut flour” in the recipe calculation to include the sprinkles. Since the amount of food coloring in the cake recipe is so minimal, the food coloring can be counted as a “free food” item. 23 grams (1.5 tablespoons) oil – use a neutral flavor such as sunflower, avocado or algae oil (not coconut since it hardens at room temperature). Sweetener of choice (5 grams or 2 packets of Truvia was used for testing). Mix 10 grams of plain coconut flour with the oil. Stir until smooth. Add the xanthan gun, baking powder, extract, water, salt and sweetener. Stir again until all of the ingredients are very well combined. Add about 10 grams of the whipped egg whites plus the additional 2g of colored coconut flour. Stir until the egg whites are incorporated and the batter has “loosened” slightly. Add the remaining egg whites and carefully fold them into the cake batter. Continue folding the egg whites into the batter until evenly distributed. Pour the batter into a greased baking dish or silicone mold (a 1-cup glass Pyrex container was used for testing). Bake the cake at 350 degrees for 5 minutes. After 5 minutes, turn the oven down to 300 degrees. Continue to bake for an additional 25-30 minutes. 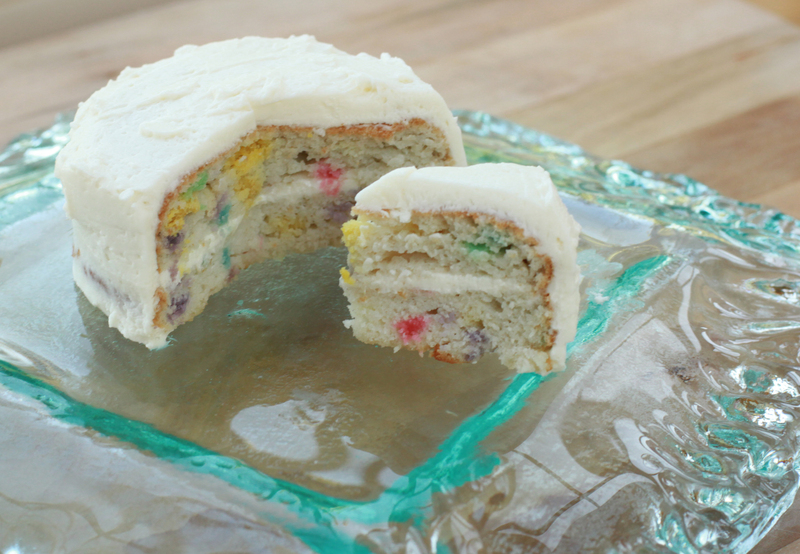 The cake should spring back when the center is pressed lightly with your finger. Allow to cool completely before slicing or frosting. If possible let the cake cool upside down (similar to an angel food cake), this will help prevent it from collapsing. It will sink slightly as it cools, however it you find it is going flat, it may have been slightly undercooked. Xanthan gum and konjac root are stabilizers and emulsifiers that give the baked cake a spongy texture and helps hold all of the oil. It allows it to rise and hold the tiny bubbles created by the baking powder. If the xanthan gum or konjac is not used, the texture of thecake will be denser. Neither ingredient contributes to the overall flavor it only helps improve the texture. If you like this recipe, you’ll love my… Cauliflower & Cheddar Hash Browns! I live in Cuba, my daugther have GLUT1 DS and i have been unable to obtain access to the full recipe of this cake in Scrib and i can’t find it on the site of the Charlie Foundation, perhaps this is due to my clumsiness. Please could you tell me how to get the full recipe or send it to me to jesusg@inpud.co.cu . This is awesome, thanks for sharing! I actually used two of your recipes together to make Nic’s Birthday cake, and he Loved it. I used your lemon pound cake, but added the colored coconut flour. I made a whipped cream frosting with truvia colored sprinkles on top!! Thanks for sharing your amazing recipes. Keep them coming please! Never mind about the second page–that was on my ipad but the whole recipe appears on 1 page on my computer so I got it. Thanks. Sorry about that Janah! I find that Scribd changes the formatting or different devices.. We were having trouble uploading content to the Charlie Foundation site, so we put it on Scribd temporally. We will get it permanently posted on the CF site soon! Hope it turns out well!! Let me now if you have any questions. I did a trial of this for my daughter’s birthday now I am making the actual cake and page two does not come up. Maybe I’m just dense, but I can’t see the actual recipe…. It got buried under new postings in FB, I added a link to it at the top of the page. Look for it after the bold link to the FB page, Click “here”. My daughter and I thank you from the bottom of our hearts for this recipe!!! My daughter has been on Keto diet for 2 years – and her 13th birthday is next month. She cheered when she learned she’d have an actual birthday cake for the big day! Our wonderful Keto dietician helped us create a version of the cake that is 4:1. We did a test run of it this weekend – she just loved it! Hi Amy! I used the recipes as a starting point when Jude was on 4:1 ratio–just played around in ketocalculator to get the right combo…had our dietician double check and it worked well!! You are more than welcome to share any re-calculations in the comments sections! People often ask about re-calculations, but I just cant do all of them (and re-cook to test). If you re-calculated and the recipe turned out well, please let others know if you have the time! I understand why you are frustrated. The meals on here are my personal calculations that I have made for my daughter (who obviously has different nutritional needs than you child). I try to calculate higher ratio/lower carb meals when I have time, but most often I barely have enough time to post what I already have! I hope that people are able to see the recipes and use them as a starting point, for instance.. In your case I would add more oil to the cake above, use about half of the amount to lower the carb and increase the frosting to meet the protein needs. It may not come out exactly the same, but maybe you will end up with something your child will enjoy. The worst part about creating keto recipes is knowing that every single person who makes it, will have to change it! It can result in a lot of failures, but hopefully a few successes as well. I am working with the Charlie Foundation to create recipes and more of them will be higher ratio as well as lower MAD/LGIT versions. I am sorry you have been unable to use many on this site so far, but please know that more are always in the works!